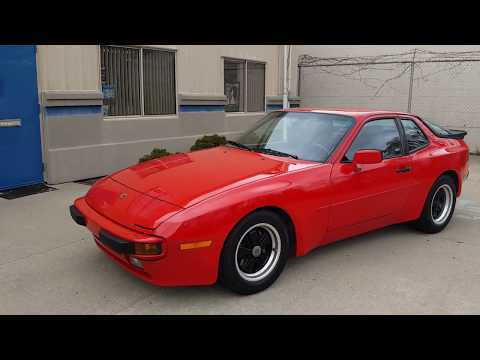 1986 Porsche 944, Guards Red with black leather interior, 86K One Owner miles, 5-speed stick shift. Removable roof panel, staggered Fuchs wheels, power windows, locks, mirrors, Blaupunkt radio. Excellent body condition, no rust, dings or scratches. Very nice leather seats and original dash. Recent full service including timing belt and fluids changed (See Carfax). New motor mounts just installed. Fully detailed. EXTRA CLEAN! We offer Credit Union Financing with 60-month terms. We have drive train to bumper to bumper warranties available on most vehicles. All cars are stored indoors for your convenience and are fully detailed. Trade-ins are accepted. We are a small dealership that loves the cars that we sell! Select Motors, LTD. has been visited 13,718,989 times.